^ 1.0 1.1 1.2 Planck collaboration. Planck 2013 results. XVI. Cosmological parameters. Astronomy & Astrophysics. 2014. Bibcode:2014A&A...571A..16P. arXiv:1303.5076. doi:10.1051/0004-6361/201321591. ^ 2.0 2.1 Itzhak Bars; John Terning. Extra Dimensions in Space and Time. Springer. 2009: 27ff [2011-05-01]. ISBN 978-0-387-77637-8. ^ Paul Davies. The Goldilocks Enigma. First Mariner Books. 2006: 43ff [2013-07-01]. ISBN 978-0-618-59226-5. ^ 4.0 4.1 NASA/WMAP Science Team. Universe 101: What is the Universe Made Of?. NASA. 24 January 2014 [2015-02-17]. ^ 5.0 5.1 Fixsen, D. J. The Temperature of the Cosmic Microwave Background. The Astrophysical Journal. 2009, 707 (2): 916–920. Bibcode:2009ApJ...707..916F. arXiv:0911.1955. doi:10.1088/0004-637X/707/2/916. ^ 6.0 6.1 6.2 First Planck results: the Universe is still weird and interesting. Matthew Francis. Ars technica. 2013-03-21 [2015-08-21]. ^ NASA/WMAP Science Team. Universe 101: Will the Universe expand forever?. NASA. 24 January 2014 [16 April 2015]. ^ Universe. Webster's New World College Dictionary, Wiley Publishing, Inc. 2010. ^ Universe. Merriam-Webster Dictionary. [2012-09-21]. ^ Zeilik, Michael; Gregory, Stephen A. Introductory Astronomy & Astrophysics 4th. Saunders College Publishing. 1998. ISBN 0030062284. The totality of all space and time; all that is, has been, and will be. ^ Brian Greene. The Hidden Reality. Alfred A. Knopf. 2011. ^ Dold-Samplonius, Yvonne. From China to Paris: 2000 Years Transmission of Mathematical Ideas. Franz Steiner Verlag. 2002. ^ Hawking, Stephen. A Brief History of Time. Bantam Books. 1988: 125. ISBN 0-553-05340-X. ^ The Nobel Prize in Physics 2011. [16 April 2015]. ^ Planck reveals an almost perfect universe. Planck. ESA. 2013-03-21 [2013-03-21]. ^ Tegmark, Max. The Mathematical Universe. Foundations of Physics: 101–150. Bibcode:2008FoPh...38..101T. arXiv:0704.0646. doi:10.1007/s10701-007-9186-9. a short version of which is available at Shut up and calculate. (in reference to David Mermin's famous quote "shut up and calculate" 存档副本. [2015-06-02]. （原始内容存档于2016-05-15）. ^ Jim Holt. Why Does the World Exist?. Liveright Publishing. 2012: 308. ^ Timothy Ferris. The Whole Shebang: A State-of-the-Universe(s) Report. Simon & Schuster. 1997: 400. ^ The Compact Edition of the Oxford English Dictionary, volume II, Oxford: Oxford University Press, 1971, p. 3518. ^ Lewis, C. T. and Short, S (1879) A Latin Dictionary, Oxford University Press, ISBN 978-0-19-864201-5, pp. 1933, 1977–1978. ^ Lewis, C. T.; Short, S. A Latin Dictionary. Oxford University Press. 1879: 1881–1882, 1175, 1189–1190. ISBN 0-19-864201-6. ^ The Compact Edition of the Oxford English Dictionary II. Oxford: Oxford University Press. 1971: 909, 569, 3821–3822, 1900. ISBN 978-0198611172. ^ Joseph Silk. Horizons of Cosmology. Templeton Pressr. 2009: 208. ^ Simon Singh. Big Bang: The Origin of the Universe. Harper Perennial. 2005: 560. ^ C. Sivaram. 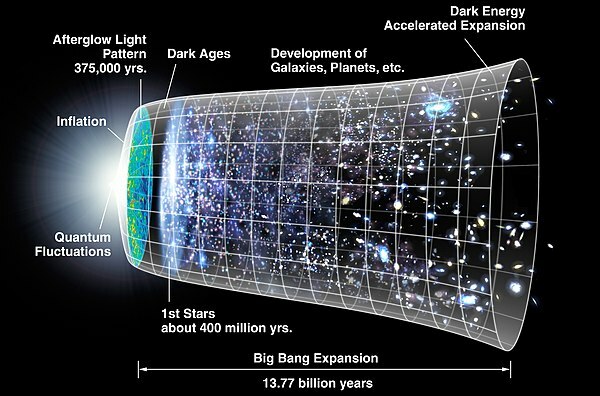 Evolution of the Universe through the Planck epoch. Astrophysics & Space Science. 1986, 125: 189. Bibcode:1986Ap&SS.125..189S. doi:10.1007/BF00643984. ^ Brill, Dieter; Jacobsen, Ted. Spacetime and Euclidean geometry. General Relativity and Gravitation. 2006, 38: 643. Bibcode:2006GReGr..38..643B. arXiv:gr-qc/0407022. doi:10.1007/s10714-006-0254-9. ^ Antimatter. Particle Physics and Astronomy Research Council. October 28, 2003 [2006-08-10]. （原始内容存档于2004年3月7日）. ^ Landau & Lifshitz (1975， p. 361): "It is interesting to note that in a closed space the total electric charge must be zero. Namely, every closed surface in a finite space encloses on each side of itself a finite region of space. Therefore the flux of the electric field through this surface is equal, on th eone hand, to the total charge located in the interior of the surface, and on the other hand to the total charge outside of it, with opposite sign. Consequently, the sum of the charges on the two sides of the surface is zero." ^ McCall, Storrs. A Model of the Universe: Space-time, Probability, and Decision. Oxford University. : 23. ^ Michio Kaku. Physics of the Impossible: A Scientific Exploration into the World of Phasers, Force Fields, Teleportation, and Time Travel. Knopf Doubleday Publishing Group. 11 March 2008: 202–. ISBN 978-0-385-52544-2. ^ Edward Robert Harrison. Cosmology: the science of the universe. Cambridge University Press. 2000: 447– [1 May 2011]. ISBN 978-0-521-66148-5. ^ Andrew R. Liddle; David Hilary Lyth. Cosmological inflation and large-scale structure. Cambridge University Press. 13 April 2000: 24– [1 May 2011]. ISBN 978-0-521-57598-0. ^ What is the Ultimate Fate of the Universe?. National Aeronautics and Space Administration. NASA. [23 August 2015]. ^ Will the Universe expand forever?, WMAP website at NASA. ^ Roukema, Boudewijn; Zbigniew Buliński; Agnieszka Szaniewska; Nicolas E. Gaudin. A test of the Poincare dodecahedral space topology hypothesis with the WMAP CMB data. Astronomy and Astrophysics. 2008, 482 (3): 747. Bibcode:2008A&A...482..747L. arXiv:0801.0006. doi:10.1051/0004-6361:20078777. ^ Aurich, Ralf; Lustig, S.; Steiner, F.; Then, H. Hyperbolic Universes with a Horned Topology and the CMB Anisotropy. Classical and Quantum Gravity. 2004, 21 (21): 4901–4926. Bibcode:2004CQGra..21.4901A. arXiv:astro-ph/0403597. doi:10.1088/0264-9381/21/21/010. ^ Planck reveals 'almost perfect' universe. Michael Banks. Physics World. 2013-03-21 [2013-03-21]. ^ Fritzsche, Hellmut. electromagnetic radiation | physics. Encyclopedia Britannica: 1. [2015-07-26]. ^ Physics 7:Relativity, SpaceTime and Cosmology (PDF). Physics 7:Relativity, SpaceTime and Cosmology. University of California Riverside. [2015-07-26]. （原始内容 (PDF)存档于2015-09-05）. ^ Physics - for the 21st Century. www.learner.org. Harvard-Smithsonian Center for Astrophysics Annenberg Learner. [2015-07-27]. ^ Redd,SPACE.com, Nola Taylor. It's Official: The Universe Is Dying Slowly. [2015-08-11]. ^ RIP Universe - Your Time Is Coming… Slowly | Video. Will Parr, et al. Space.com. [2015-08-20]. ^ 55.0 55.1 Peebles, P. J. E. & Ratra, Bharat. The cosmological constant and dark energy. Reviews of Modern Physics. 2003, 75 (2): 559–606. Bibcode:2003RvMP...75..559P. arXiv:astro-ph/0207347. doi:10.1103/RevModPhys.75.559. ^ Mandolesi, N.; Calzolari, P.; Cortiglioni, S.; Delpino, F.; Sironi, G.; Inzani, P.; Deamici, G.; Solheim, J. 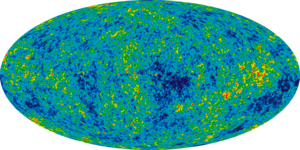 -E.; Berger, L.; Partridge, R. B.; Martenis, P. L.; Sangree, C. H.; Harvey, R. C. Large-scale homogeneity of the Universe measured by the microwave background. Nature. 1986, 319 (6056): 751. doi:10.1038/319751a0. ^ Vergano, Dan. Universe holds billions more stars than previously thought. USA Today. 1 December 2010 [2010-12-14]. ^ Mackie, Glen. To see the Universe in a Grain of Taranaki Sand. Swinburne University. February 1, 2002 [2006-12-20]. ^ Hubble's Largest Galaxy Portrait Offers a New High-Definition View. NASA. 2006-02-28 [2007-01-03]. ^ Earth's new address: 'Solar System, Milky Way, Laniakea'. Elizabeth Gibney. Nature. 3 September 2014 [21 August 2015]. ^ Local Group. Fraser Cain. Universe Today. 4 May 2009 [21 August 2015]. ^ Astronomers discover largest known structure in the universe is ... a big hole. The Guardian. 20 April 2015. ^ Andrew Liddle. An Introduction to Modern Cosmology (2nd ed.). John Wiley & Sons. 2003. ISBN 978-0-470-84835-7. . p. 2. ^ Livio, Mario. The Accelerating Universe: Infinite Expansion, the Cosmological Constant, and the Beauty of the Cosmos. John Wiley and Sons. 2001: 53 [31 March 2012]. ^ Carroll, Sean. The cosmological constant. Living Reviews in Relativity. 2001, 4 [2006-09-28]. （原始内容存档于2006-10-13）. ^ Roberto Emparan García de Salazar. Iluminando el lado oscuro del universo: Agujeros negros, ondas gravitatorias y otras melodías de Einstein. Editorial Ariel. 2018. ISBN 978-8-434-42731-0.